Ocean views, a bevy of dining options and live entertainment kick things off at the Hyatt Ziva Cancun - All Inclusive Resort. Balconies with ocean views or terraces with garden access, floor-to-ceiling windows, sofa beds, free Wi-Fi, flat-panel HDTVs, coffeemakers, complimentary drinks and marble bathrooms with rainfall showerheads are featured within 547 rooms at the high-rise Hyatt Ziva. Non-smoking rooms are available. Pamper yourself with a body treatment in the spa, and relax with a refreshing swim in any of three infinity pools. Fitness and business facilities are provided. In addition to eight restaurants plus multiple bars, the hotel also offers tequila and beer tastings, all included. Live entertainment, water sports and tennis are all part of the fun package, and parking is free. The Hyatt Ziva is nestled within Cancun's Hotel Zone at the Caribbean coastline, less than a half-mile northeast of Coco Bongo. Travel 10 minutes by car to reach La Isla Shopping Village, or hop on the ferry to Cozumel, 50 miles south. Cancun International Airport is within 15 miles of the hotel. At the Hyatt Ziva Cancun - All Inclusive Resort, guests can kick back and relax over tequila tastings, a swim and a soothing spa services. 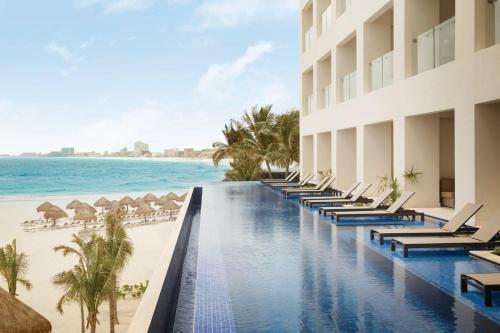 Hyatt Ziva Cancun-All Inclusive Resort is an ideal Cancún lodging choice for your trip to Mexico. With numerous amenities for guests such as room service, 24 hour front desk, jacuzzi or spa, you will wake up at Hyatt Ziva Cancun-All Inclusive Resort feeling refreshed every day for your time in Cancún. Don’t let this amazing reservation opportunity pass you by, book your stay at Hyatt Ziva Cancun-All Inclusive Resort today to make the most of your time in Cancún, Mexico.